Thank you for all of those who purchased a paver! We are no longer accepting new orders for pavers at this time. 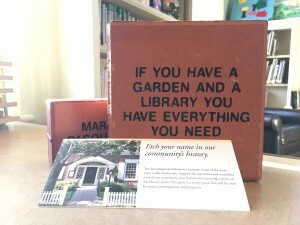 If you’re looking for a wonderful way to leave a permanent mark on our Library, consider purchasing a paver! These wonderful red bricks come in two sizes, and will be used in the Library’s new back patio. Honor a friend, relative, local group, or beloved pet with a 4×8 paver for $100, or an 8×8 paver for $250. For more information, call the Library at (518) 758-6192 or email us at info@kinderhooklibrary.org.